Pipedrive is a CRM and sales management software designed to help sales teams manage intricate or lengthy sales processes. A lot of our prospects and clients use lightweight CRM such as Pipedrive. As a matter of fact, we do use Pipedrive as well. We are our first own users for this feature. Why Connecting Livestorm and Pipedrive? By connecting Livestorm and Pipedrive together you can send your registrants/attendees automatically to your sales pipeline, under a specific stage. This is great to make sure that your sales team will follow up on the leads you generate via your webinars. 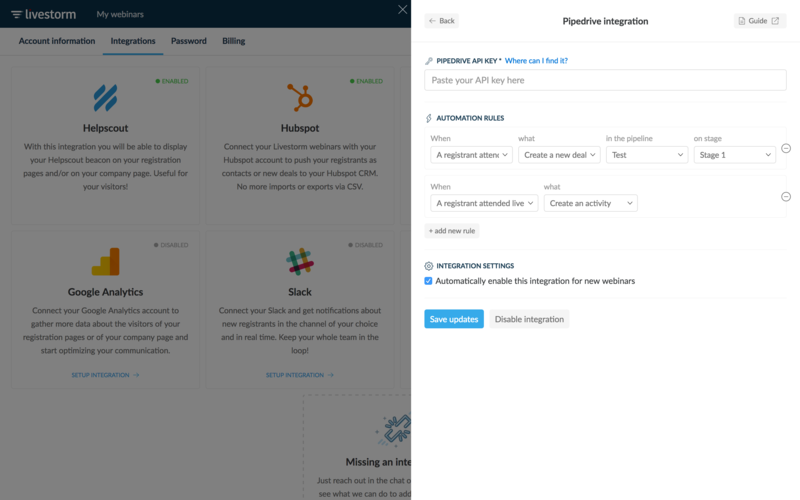 First, you need to grab your Pipedrive API key. 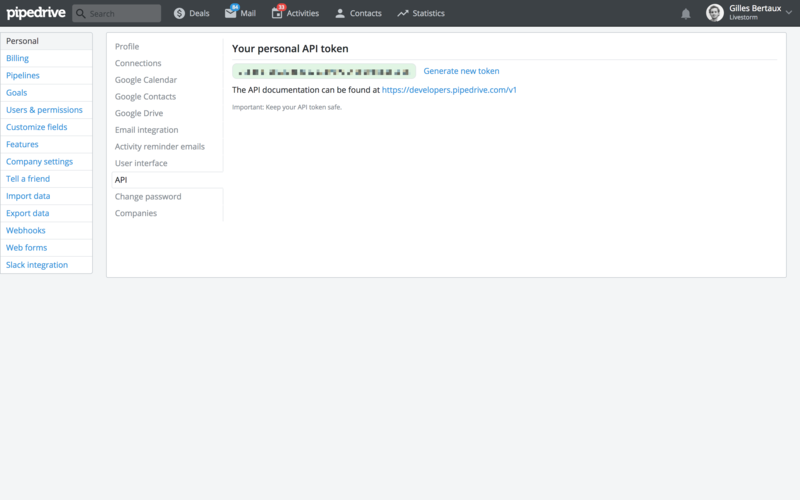 Go to your Pipedrive account settings, under personal API and copy the sequence of characters. It looks like the screenshot below. If you can't find it, follow this tutorial. Now you can go to your Livestorm account. 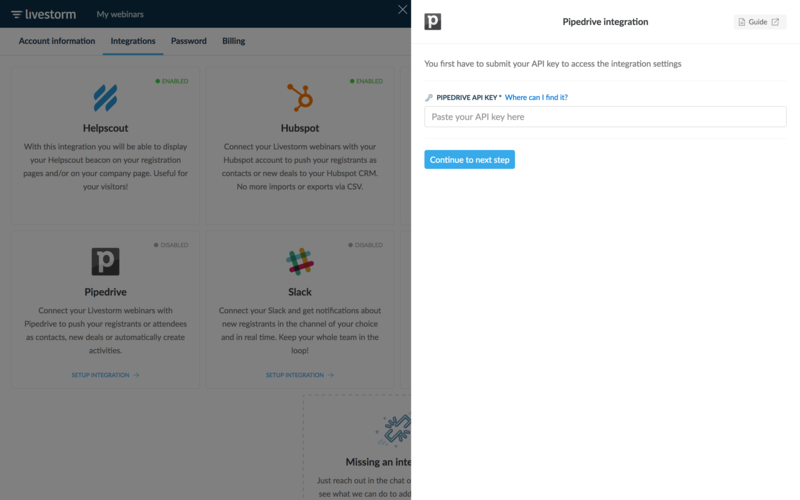 Go to Settings > Integrations > Pipedrive and just fill out the form with your Pipedrive API key. Based on your attendees behaviour you can trigger specific actions in Pipedrive. *This means that this will update your contact if it is already in your Pipedrive. If it doesn't exist yet, it will create it. Also, we will never override existing data. We'll just add information that is missing. When we create or update a contact or a company we make sure to pass the data from your registration form as well. Meaning that if you use our preset fields such as phone, company, website, first name, name, etc. we will map those fields with the ones on Pipedrive. My deal is not created, why? When we detect a new registration or a new attendee, we look for a registration field "company" (if not found, we detect the company based on the email domain). Then we search for the company on Pipedrive. Then we look for a deal attached to the contact. If it exists, we don't do anything. If not, we create the deal. If there's a deal attached in the specified pipeline we don't create the deal. If there's no deal attached then we create the deal. ⚠️To make sure you keep your pipeline clean and don't end up with duplicates, we won't create the deal even if the deal is marked as "lost" in Pipedrive. The deal does not exist (lost, open, etc).